Many of us were hooked on gardening when our parents gave us a tiny plot of ground in our backyard for our first little garden. What did you grow to ignite the spark? Given our preference, most of us would prefer a vegetable garden layout that utilizes three-foot-wide raised beds. Experts say this is the key to beautiful and productive gardens. Here are the essentials of a vegetable garden. There's no better way to start than by choosing a sunny spot for your garden. Most vegetables need six to eight hours of direct sun a day for best results. Leafy greens like spinach and lettuce can thrive with a bit less. As you assess your yard this winter, remember that the deciduous trees that are leafless now will cast shadows as the seasons progress. If possible, locate the garden so that access to and from the kitchen is easy and convenient. It's best if you can view the garden from a window. When the garden is easy to see and reach, you are more apt to notice what needs to be tended and to take full advantage of the harvest. The ideal garden location has loose soil that drains well. If your soil isn't perfect, you can improve it over time by adding organic matter such as compost. Don't forget to check out Lasagna Gardening and Organic Ade for more soil tips. A 20- by 20-foot garden gives you room to grow a wide range of crops, including some tasty "space hogs" such as corn and winter squash. A 12- by 16-foot plot is sufficient for a garden sampler with a variety of greens, some herbs, a few tomatoes and peppers, beans, cucumbers and even edible flowers such as nasturtiums for garnishes. By growing plants in succession and using three-foot-wide beds with 18-inch paths, you should have plenty of luscious vegetables for fresh eating and extras for friends. You can go smaller yet and get a bountiful harvest by gardening intensively. See out friends over at Square Foot Gardening for the whole dirt on this! Use the following information as a guideline, substituting crops to suit your own tastes. Always include flowers in the vegetable garden because they are beautiful and a joy to cut and bring indoors. Flowers also attract pollinating insects to the garden, and some repel pests and diseases. If you'd rather design your garden from scratch, I recommend plotting it on graph paper. Use paper with a grid of 1/4-inch squares, with each square representing one foot in the garden. Outline the beds in pencil, then fill in the plant names. If you are designing your veggie garden from scratch, plot it on graph paper. Use paper with a grid of 1/4-inch squares, with each square representing one foot in the garden. Outline the beds in pencil, then fill in the plant names. In spring, stake the garden according to your plan. You'll need a tape measure, plenty of string, 12- to 18-inch stakes and a hammer to drive the stakes into the ground. Mark it off as per your plan. For best sun exposure, orient the garden so the rows run east to west, with the tallest plants on the north end. Following your plan, drive a stake in each of the four corners of the garden. You may need to rototill your garden, then dig by hand, adding amendments, and remove existing weeds. For best sun exposure, orient the garden so the rows run east to west, with the tallest plants on the north end. Following your plan, drive a stake in each of the four corners of the garden. At this point you'll need to rototill or turn the garden by hand and remove existing weeds. If you haven't had your soil tested to determine the soil pH, do it now. Most vegetables require a pH between 6.0 and 6.8. Limestone is often necessary to raise the pH in high-rainfall areas; use sulfur to lower the pH in the arid West. Your extension service will advise you on how to test the soil and make recommendations on how to improve it. Next, measure and stake each garden bed, and outline the beds with string. To raise a bed, first loosen the soil in the bed using a shovel or a garden fork, then shovel soil from an adjacent path onto the bed. You can also stand in a pathway and use a rake to bring up soil from the next pathway. 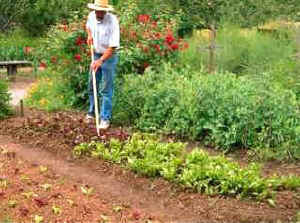 Smooth the soil on the surface of the bed by raking, using both the tines and the back edge of the rake. It takes time to shape the beds - but it's important to get the beds right from the start. Draw the soil evenly between the string boundaries, letting excess soil fall off the edge of the bed outside the string. The object is to end up with a flat-topped raised bed that extends fully to the string boundaries. Each bed should rise about eight inches above the pathway. Rake the paths to level them; you want them flat, not U-shaped. If you want to make your bed permanent, edge with wood, logs, bricks, rocks, or anything else that will keep your soil in place. This will be required if your land is sloped. You can even create raised beds inside an old tractor tire. Gardening organically is ideal, to address the soil's long-term needs by supplying plant nutrients with natural fertilizers and compost. Building soil takes time, and nutrients from most organic products are released into the soil slowly. As you build each bed, broadcast several inches of compost or natural fertilizers like decomposed chicken manure over the surface and work it into the soil with a rake. For a 12 by 16-foot garden (almost 200 square feet), use 30 pounds of aged chicken manure, 75 pounds of horse manure or 75 pounds of commercial compost; use twice as much for a 20- by 20-foot plot. If your garden is being created in previously uncultivated soil, apply five pounds of an organic fertilizer with approximately 5% nitrogen per 200 square feet. (The percentage of nitrogen is the first number of the three listed on the label.) Fill a bucket with the total amount you'll need for all your beds, then broadcast it evenly over the beds (not in the paths). Rake the fertilizer into the top few inches of soil. Many vegetables are best started from seeds sown directly in the ground (direct-sown); others go in as seedlings. You can grow your own seedlings indoors or buy them. As you plant, you'll need to keep in mind which vegetables are frost-tolerant and which are not (like the tomatoes shown). In early spring, a week or two before the last frost, sow beets, carrots, parsnips, peas, radishes, Swiss chard and turnips, as well as the many delectable salad greens such as arugula, Asian mustards, cress and leaf lettuce directly in the garden. These greens grow particularly fast from seed. After the last frost, direct-sow beans, corn and squash. Among herbs, dill and cilantro are sure bets from direct-sown seed. Better results are achieved if you buy or start some vegetables indoors - weeks to months before you last frost date. Transplants of broccoli, Brussels sprouts, heading cabbage and cauliflower, as well as, eggplant, parsley (shown), peppers and tomatoes work best for zones 7 and colder. We can help with that too - check out Indoor Gardening, Seed Starter and Seedling Helper. There are several vegetables, such as summer squash, lettuce and fall-planted broccoli, that grow and produce equally well from either seeds or transplants. Base your choice with these crops on convenience and timing more than anything else. Among the easiest vegetable crops to grow are arugula, beets, Swiss chard, green beans, leaf lettuce, parsley, peppers, radish, summer squash and tomatoes. All adapt well to various regions if planted at the right time for your region. The average date of last frost in spring is the key date to use in garden planning. If you don't know the date for your region, check with your local extension service or a local nursery. You can safely plant the "cool-season vegetables" such as broccoli, Brussels sprouts, cabbage, celery, parsley, peas, radishes and spinach before the last frost date. In mild-winter climates, these crops are usually planted in fall for winter gardens. Arugula, beets, endive, leaf lettuce, parsnips, potatoes and Swiss chard are a bit less frost-hardy but still grow well in cool weather. Plant "warm-season vegetables" such as green beans, corn, cucumbers, eggplant, melons, peppers, summer squash and tomatoes only after the threat of frost has passed. Like anything else, once you go through the process once or twice, you'll make refinements. For instance, you'll discover various ways to use your space more efficiently. A favorite method is planting a warm-season crop such as zucchini after harvesting a cool-season crop such as peas. Another example is interplanting. Plant a quick-maturing crop such as lettuce close to a slow-grower such as broccoli. The lettuce is harvested by the time the broccoli needs the space. Anytime you grow a lot of one type of vegetable - tomatoes and peppers, for instance - plant several different varieties. This increases your chances of success, since some varieties will perform and taste better than others. Finally, don't neglect the most obvious advice; ask your local experts. Your local extension service can usually supply a list of recommended vegetable varieties for your area. Master Gardeners, garden centers and gardening neighbors are other great sources of information.